Located in the southwestern United States and northwestern Mexico, the Colorado River is a 2,330-kilometer (1,450-mile) river with its headwaters in the Rocky Mountain National Park in north-central Colorado. The river is the primary source of water for a region that receives little annual rainfall. More than 1,000 years ago, Native Americans irrigated their crops with the waters from the river. Today, the Colorado River is still used for irrigation , but it is also used to generate hydroelectric power and to supply water to distant urban areas. The Colorado River has been a central feature in the history and development of the American West. Management efforts in the Colorado River Basin embody society's struggle to overcome conflicts between competing interests over a shared water resource. The Colorado River system, including the Colorado River, its tributaries , and the lands that these waters drain, is called the Colorado River basin, or watershed. It drains an area of 637,000 square kilometers (246,000 square miles), including parts of seven western U.S. states (Wyoming, Colorado, Utah, New Mexico, Nevada, Arizona, California) and Mexico. Three-fourths of the Colorado basin is federal land comprised of national forests, national parks, and Indian reservations. The drainage basin's total runoff is about 700 cubic meters (24,700 cubic feet) per second. It is the international boundary for 27 kilometers (17 miles) between Arizona and Mexico. The Colorado River Basin offers a major renewable water supply in the southwestern United States. About two-thirds of the water flowing in the Colorado River and its tributaries is used for irrigation, and the other one-third supplies urban areas, evaporates into the atmosphere, or provides water to riparian (streamside) vegetation. Without Colorado River water, the region would support few crops, and major cities such as Las Vegas, Nevada, and Phoenix, Arizona, would not have grown so rapidly. A young member of the Cocopah Indians of northern Mexico plays in a dried-up arm of the Colorado River near the town of El Mayor, Mexico. The Colorado River, on which the Cocopah people fished and farmed for about 2,000 years, is often drained dry by upstream demand before reaching this part of Baja, California. Today nearly 17 million people depend on the Colorado's waters. The basin population has expanded dramatically in recent years, with most growth occurring in urban areas, where about 80 percent of the region's residents live. Phoenix and Tucson, Arizona, and Las Vegas, Nevada are the largest cities in the basin, and they use the Colorado River and its tributaries as their primary source of water. Water from the Colorado River is taken from its primary route and transported to locations far from the Colorado River Basin. For example, water is diverted eastward across the Rocky Mountains to Denver and other cities in Colorado. The Colorado River Aqueduct carries water to metropolitan Los Angeles, and the Central Arizona Project supplies the Phoenix and Tucson areas. The All-American Canal provides water for the Imperial Valley of southern California, a productive agricultural region converted from a desert. Numerous dams were built on the Colorado and its tributaries during the twentieth century. The purpose of these dams was primarily to generate electricity, control floods, and provide recreational opportunities. They also store water during wet times for use during the dry months and, in some cases, during dry years. The basin dams are able to store more than 86 billion cubic meters (3,037 billion cubic feet) of water, which is about four times the Colorado River's average annual runoff. The largest of these facilities, completed in 1936, is Hoover Dam, located on the border between Nevada and Arizona. The second largest dam is Glen Canyon Dam, which is in north-central Arizona and began operating in 1964. These two dams provide about 80 percent of the water-storage capacity in the basin. Hydroelectric generation from water stored at dam sites along the Colorado River totals about 12 billion kilowatt-hours per year, which is roughly equivalent to one-sixth of the electricity consumed in Arizona each year. This power is shared among several western states. The dams of the Colorado River are used to control flooding and to permit development of flood-prone land along lower reaches. In addition, some of the reservoirs created by dams have been formed into national recreational areas comprising spectacular engineered wonders amidst natural landscapes. For example, Lake Mead National Recreation Area is made up of Lake Mead, formed by Hoover Dam, and Lake Mohave, formed by Davis Dam, while the Glen Canyon National Recreation Area includes Lake Powell. The Colorado Basin states were anxious about their shares of the Colorado River as early as the 1900s. Then as now, growth within the state of California was viewed with concern, as burgeoning expansion meant increased water demands. The signing of the Colorado River Compact in 1922 was an important milestone in the management of the Colorado River and became the foundation for the law of the river. This compact included the seven Colorado River Basin states, and apportioned water from the Colorado River between the Upper and Lower Basin states. The parties to the Colorado River compact were not unduly concerned with Indian water rights, nor did the Compact include provisions to protect the environment. In 1963, a U.S. Supreme Court decision stated the amount of water to be apportioned among the lower-basin states, as well as the amounts that had been historically reserved for Indian tribes and federal public lands. Because of this landmark case, tribes are now considered to have the best water rights along the Lower Colorado River. The competition for water in the Colorado River Basin continues to be severe, as is shown by the increasing numbers of lawsuits that are within the court system. Water projects must now thoroughly research various environmental-impact studies in accordance with federal environmental protection legislation. The apportionment of the waters of Colorado River has been cause for a great deal of controversy. The impact of dams and canals along the Colorado has spawned widespread debate on river development and the ecological role of instream flows. Given projected growth in its region, these controversies and debates will continue for some time. A water quality problem that has grown in importance within the Colorado River is salinity, or the amount of solids (mostly salt) in the water. A variety of sources bring such dissolved salts into the river. The majority of salts run naturally off of soils and rocks. When river water is used for irrigation, some salts evaporate, and become concentrated in the remaining water that returns to the river. The salt problem is also caused by evaporation from reservoir surfaces and water use by plants along the river. The concentration of salt in the water of the lower river valley is so high that it cannot be used for human consumption without treatment. As a result, a desalinization plant near the border with Mexico removes salt from the river and allows the United States to provide Mexico with usable water. Significant water quality problems occur in the Colorado River Basin, primarily because the river carries an estimated 9 million tons of salts annually. This amount is expected to increase in the future because of increased human use. Even worse, the lower Colorado River contains about 2,000 pounds of salts per acre-foot. 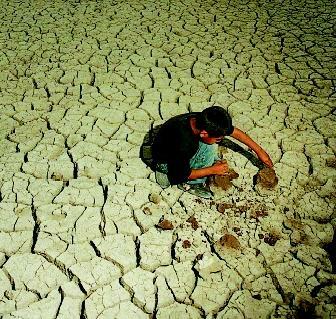 Salinity increases downstream primarily owing to agriculture, evaporation, and the leaching of salts from soils. High salinity levels also originate in several tributaries, especially the Virgin River that flows through Arizona into Nevada. Environmental groups study the high salinity in the Colorado River and regularly meet to address this issue and other related water quality problems. SEE ALSO Dams ; Desalinization ; Hoover Dam ; Instream Water Issues ; Planning and Management, Water Resources ; Powell, John Wesley ; Prior Appropriation ; Reservoirs, Multipurpose ; Rights, Public Water ; River Basin Planning ; Supply Development . Graf, William L. The Colorado River: Instability and Basin Management. Washington D.C.: Association of American Geographers, 1985. Waters, Frank. The Colorado. New York: Rinehart, 1946. Colorado River Basin Salinity Control Program. Bureau of Reclamation, U.S. Department of the Interior. <http://www.uc.usbr.gov/progact/salinity/> . Colorado River Water Dispute (COLORADO Case). American University, Washington, D.C. <http://www.american.edu/ted/COLORADO.HTM> . Gillon, Kara (Defenders of Wildlife). 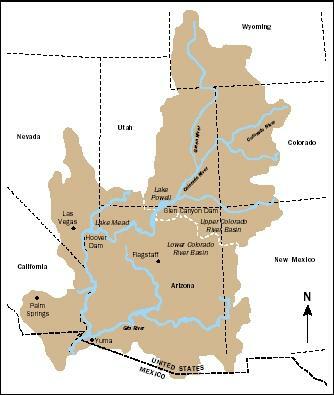 The Lower Colorado River Basin: Challenges of Transboundary Ecosystem Management. Border Information and Outreach Service (BIOS), Interhemispheric Resource Center (IRC). <http://www.us-mex.org/borderlines/2000/bl68/bl68rivbasin.html> . The Colorado River: Lifeline of the Southwest. DesertUSA.com , Digital West Media, Inc. <http://www.desertusa.com/colorado/coloriv/du_coloriv.html> .